Many closed-end funds tanked in October. Here's a look at the top and bottom performers. Closed-end mutual funds took a shellacking in October, as investors drove down stock and bond prices amid concerns over rising interest rates and a budding trade war with China. Closed-end funds in the fixed-income sector absorbed some of the hardest hits, with the discount between fund share prices and their underlying net asset value the widest it's been since 2008, according to Tom Roseen, Lipper's head of research services. "It was the toughest we have seen in a while," Roseen notes. "If you are looking at a market return, it was really quite ugly." But real estate closed end funds fared better in October than many of their equity counterparts in other sectors, posting a modest 1.56 percent decline in net assets. And CEFs focused on the U.S. mortgage market posted the shallowest loss of any closed-fund sector, equity or fixed income, with a slight, .29 percent decline, according to Lipper's FundMarket Insight Report. The relative success of closed-end real estate funds is somewhat counterintuitive given how sensitive the real estate market is to rising interest rates, Roseen notes. But closed-end investors, who prize funds with healthy dividend flows, are turning to real estate as an alternative to fixed-income funds focused on bonds, which have been some of the hardest hit by the Federal Reserve's aggressive rate push. As rates rise, bond prices typically go down as demand shifts to newer bonds paying higher rates, leaving investors who have put money into older bond issues holding the bag. CEFs often invest in real estate by bulking up on REIT stocks, which, since they are required to return 90 percent of their taxable earnings to investors in the form of dividends, provide high yields. Closed-end funds, in turn, are also structured to provide a steady stream of distributions to investors. "This is a little bit of a head scratcher," Roseen said of the comparatively solid showing by closed-end funds focused on real estate, noting rate increases are typically no friend of real estate funds. "A rise in interest rates usually knocks these guys out of contention." But if interest rates keep rising - with the Fed poised for another hike in December -- that should eventually cool down the current interest in real estate CEFs. "As soon as interest rates start rising again and again, they will become less popular," Roseen says. Meanwhile, rising interest rates and trade tensions significantly widened discounts in October for both fixed-income and equity funds. Unlike the vast majority of mutual funds, the trading price of closed-end funds often moves on a separate track from their net asset value, creating gaps that enable investors to buy the portfolio of stocks and bonds in the fund at a discount. It's not uncommon, for example, for investor to be able to get a dollar's worth of stocks and bonds for 90 cents in a closed-end fund. But whether that bet will pay off depends on whether the discount narrows, and moves back closer to the fund's share price, rewarding the investor, or widens further, expanding that gap. The median discount in fixed-income CEFs grew by 252 basis points to nearly 12.3 percent last month, while equity CEFs saw their median discount expand by 276 basis points to nearly 9 percent, Lipper reports. For all CEFs, the median discount grew by 266 basis points to nearly 11 percent. That is a significant rise from the 12-month average of 7.5 percent. Municipal debt CEFs posted their second month of declines in net asset value, averaging a 1.26 percent drop. Closed-end funds that have stocked up on California municipal debt posted the biggest declines in the sector, with an average drop of 1.47 percent, according to Lipper. By contrast, Pennsylvania municipal debt CEFs fared better at limiting losses, with a more modest 1.17 percent drop. "The writing is on the wall for fixed-income," Roseen says. "We know there is going to be another (rate) bump in December. We can expect another rate hike." 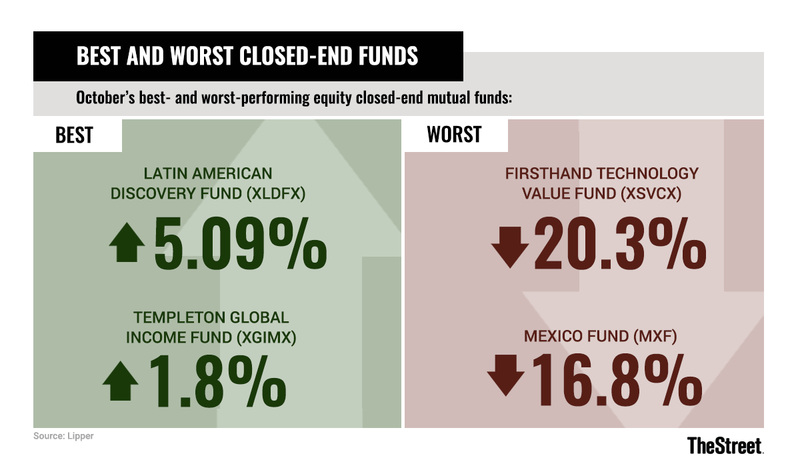 The worst performing closed-end fund on the equity side was the Firsthand Technology Value Fund Inc., which was down 20.3 percent. The fund invests in private cleantech and tech companies. Next up was the Mexico (MXF), which was down 16.8 percent for the month. However, closed-end funds focused on China and Asia Pacific countries were the "cellar dweller" on the equity side, posting an 11.22 percent plunge in net asset value, Lippers FundMarket report notes. "China took it on the chin," Roseen says. Growth CEFs and Energy MLP CEFs managed to do slightly better in limiting losses to 10.27 and 9.49 percent, respectively. The Latin American Discovery Fund posted the best returns for the month, with a 5.09 percent increase in net asset value and a fairly small 1.09 percent discount, Lipper reports. Up 1.8 percent, the Templeton Global Income Fund (XGIMX) came in at a distant second.